Memory games are a wonderful way for young children to strengthen mental synapses, increase focus, make connections (and of course, have fun). Memory Match from Kid O is no exception. 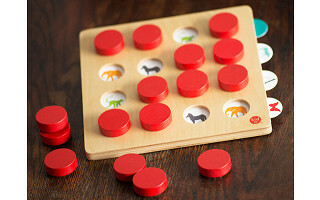 Made from wood, this high-quality, aesthetically-pleasing concentration game has an heirloom quality that appeals to both kids and grown ups alike. Each 8” x 8” board holds four double-sided, laminated, insert cards for a total of eight different ways to play. Just lift the bright red dots and make a match. Geared for three and four year olds, Memory Match 16 features colorful numbers, animals, and shapes. 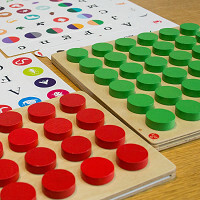 For older kids, Memory Match 36 involves greater challenges, with more dots and abstract patterns like upper and lower case letters and animal tracks. Both the board and inserts are washable and so handsomely crafted, Memory Match just may claim a permanent spot on your coffee table. Hi! My name is Christine Blumberg from Kid O Products. Our two memorization games help children boost visual skills and improve short term memory. They are wooden, high quality games – one small version and one large version. They include double-sided memory cards that help children identify numbers, animals, patterns, colors and more! Memory Match 16 (smaller version) is for age 3+ and Memory Match 36 (larger version) is for age 5+. Looks like a beautiful way to play one of my favorite games. I'm wondering though if I understood correctly that there are 8 static "fields" for the matching and no way to "shuffle them? I would think that children would very rapidly memorize where the matches are and then the game would lose it's appeal. @Madelyn - Hi Madelyn - The printed cards are "static" as you stated in your email. They are placed into the game from the right side of the board only. This is exactly why we created the larger version with 36 openings to view. These are more difficult cards (dual colors, etc) and they have more spaces for an older child. It makes the game more challenging and more difficult to recall where the images were on the board. So, I would suggest the Memory Match 36 if you have a child that would complete the Memory Match 16 quickly. I think $36 is steep for this "game". Kids can do memory games on line for nada! @Lynn I agree a cardboard memory game is available at any toy store for 6-10$$. Or you can make your own useing playng cards or flash cards. @carole Yes, you can play concentration in lots of different mediums. Our version is meant as a family keepsake to be used through many children in the family. It is something that you keep in the house always - for parents and grandparents to play with your children. It is of the highest quality - even perfect for leaving out on a coffee table for all to enjoy! Thanks, Christine. Amy from The Grommet team here. We view this game as higher than typical quality, something you'll keep for years and as Christine says, you can pass down. It's also attractive enough on its own that you could keep it out on your table when it's not being played. Memory games are a wonderful way for young children to strengthen mental synapses, increase focus, make connections (and of course, have fun). Memory Match from Kid O is no exception. 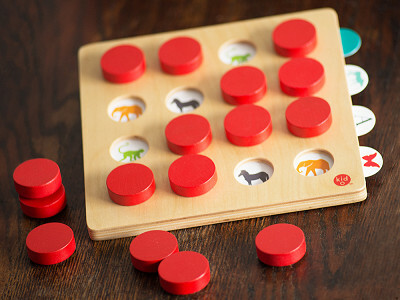 Made from wood, this high-quality, aesthetically-pleasing concentration game has an heirloom quality that appeals to both kids and grown ups alike. Each 8” x 8” board holds four double-sided, laminated, insert cards for a total of eight different ways to play. Just lift the bright red dots and make a match. Geared for three and four year olds, Memory Match 16 features colorful numbers, animals, and shapes. For older kids, Memory Match 36 involves greater challenges, with more dots and abstract patterns like upper and lower case letters and animal tracks.